Browns has been in Brighton since 1973, a claim not too many restaurants can make. I know people that always (and I mean ALWAYS) go here and I can understand why there is such a high proportion of return customers. 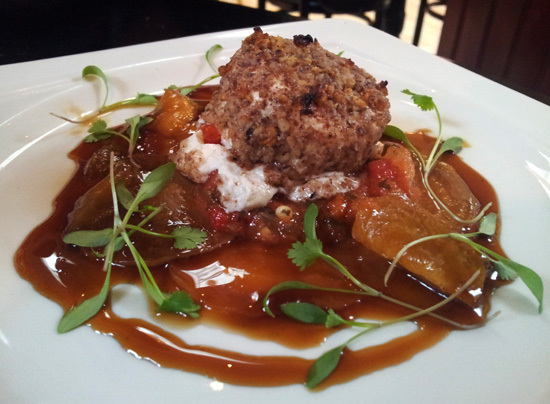 The menu is a brasserie suits-all from pies and pastas to salads and steaks. There are menus for brunch, lunch, afternoon tea and dinner to ensure maximum capture of diners at all hours. Saying that, Browns has never been an obvious choice for me. Like all chains, big or small, I almost seem to go out of my way to avoid them but now with a baby (and buggy) in tow, and often with more friends with more babies and more buggies, the chains are often the easier option, certainly in Brighton where restaurants tend to be on the cosy side. And that is a shame as Browns is actually a very attractive restaurant and clearly appeals to a wide range of people judging by the diners there; young and older couples, friends and family groups. For starters, Mr GF chose the Roasted Goat’s Cheese, £6.95, which sat prettily on slices of yellow beetroot. The pomegranate molasses vinaigrette was super teeth-tingly sweet but with all the component was a nice little starter. 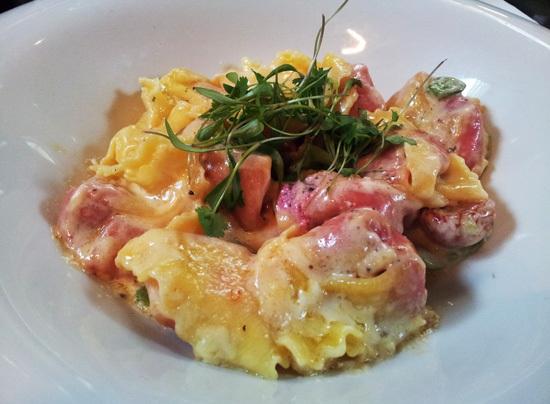 A lot of the main dishes have two prices, the lower I assumed to be a starter portion so I chose the Ricotta, Beetroot and White Truffle Tortellini, £7.45. The plate was rather gargantuan so not sure if the main size turned up by mistake or the portion was generous to a fault. Anyway, the flavours were good; ricotta and beetroot filled pasta makes for a very pretty dish as the beetroot stains the dough pink and with the truffle worked really well. The broad beans and the cherry tomatoes (not semi dried as stated) helped lighten the dish a little. The niggles, and I did enjoy the dish which is why I say niggles, for me were that the cream sauce congealed in globs and the coriander microherbs to decorate added an unnecessary and distracting flavour. Also, being ultra-picky and to show my pasta nerdiness, the dough was not worked enough and too stiff when passed through the pasta machine as it didn't have the silkiness as it could have done. 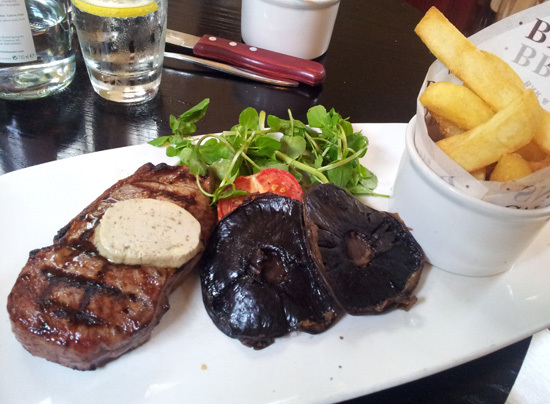 For main I chose the 21 Day Aged Sirloin Steak, £18.95. This was cooked exactly to my liking and the chunky chips were crisp and fluffy on the inside. Watercress, tomato and mushrooms are a natural accompaniment choice for the steak. Now I like anchovy and used wisely, it is a handy ingredient to enrichen flavours and is a classic partner with beef. Unfortunately, the huge patty of anchovy butter was so overwhelmingly pungent and melted into everything on the plate which was a bit of a shame. Poor steak. Poor me. Far better was Mr GF's Wild Boar and Chorizo Burger, £12.95. 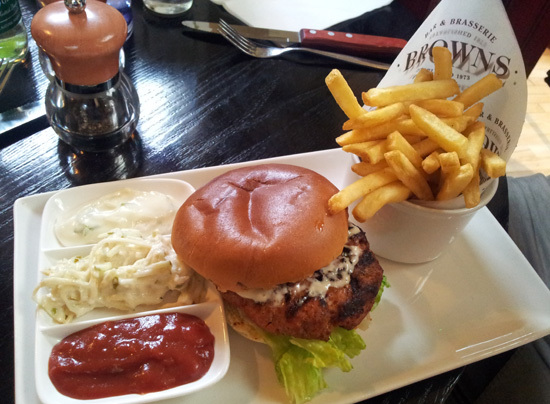 A tasty burger with a nice twist and slim fries as good as my chunky chips. I particularly liked the trio of accompaniments, garlic compote with lime and chilli mayonnaise, apple and celeriac coleslaw and the textured house ketchup. We were sadly too stuffed for dessert but the menu was tempting with plenty of classic puddings and a selection of Browns Brownies (see what they did there?). Service was friendly and smart. Whilst you may not be blown away with invention at Browns, it is a useful place to keep in mind when dining with groups or that fussy uncle as the menu is a crowd pleaser. 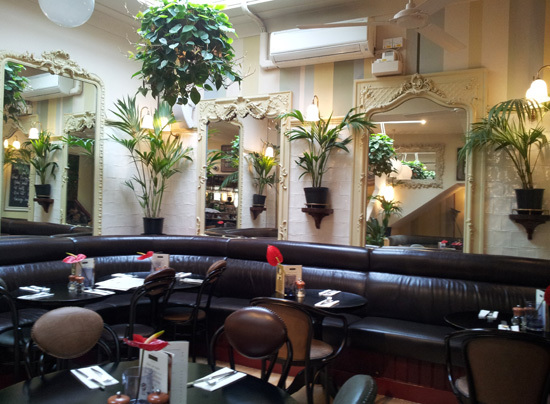 The restaurant itself, which has recently had a lick and spit, is a classically tasteful and comfortable place to spend a lingering lunch or casual dinner. Maybe the reason it has staying power is that it hasn't pushed the boundaries too far and continues to appeal to mainstream diners for 40 odd years. I was invited to review Browns.